"The Passionate Pursuit of Holiness" was RICM's theme on Sept 10 -12, 2010 at Honey Creek, Waverly Georgia. It definitely was a time of deep holiness. Many felt that this was our best Georgia Renewal Weekend in a long time. "God's Mercy Endures Forever" was our theme at our Renewal Weekend at Honey Creek, Waverly Georgia on April 30 - May 2, 2010. God's wonderful mercy moved powerfully in our midst. Praise God! 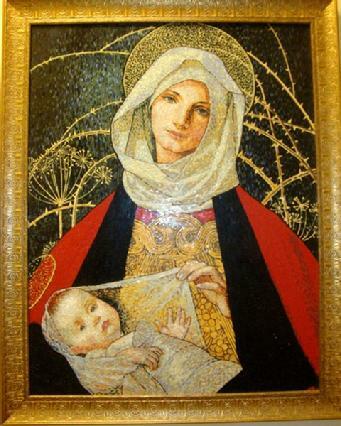 This mosaic art piece of the Mother and Child is one of many unique art pieces found throughout the New Ebenezer Retreat Center conference room and dining area. We all found this Center (RICM's first visit) to be most peaceful and conducive to our Renewal Weekends. We liked it so much that we scheduled another weekend there in January 2011. Matt led us in great times of worship throughout the weekend. As usual there was good times of ministry and times of real dedication to the Lord. People came from Texas, South Carolina, North Carolina, Virginia, Illinois, as well as Georgia.